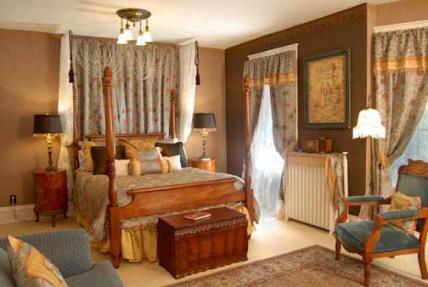 All rooms include breakfast and are based on double occupancy. 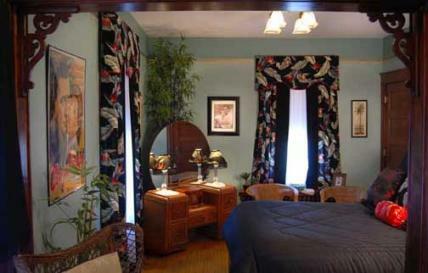 All rooms include private bathrooms, air conditioning, hair dryers, bathrobes and have free wireless internet access. Iron and ironing board available on request. Please note, a continental breakfast is served on Monday through Friday mornings. This is our most popular room! The warm brown and blue colors create a relaxing atmosphere and the beautiful and luxurious decor can't help but inspire romance! This spacious suite offers a four-poster queen bed, a whirlpool for two and a private bath, flat screen TV, A/C, as well as intimate sitting areas, and balcony overlooking front yard and Main Street. Maximum occupancy 4 guests. 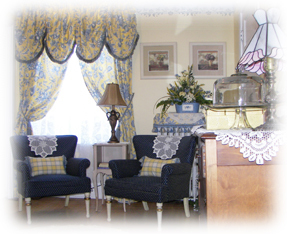 $20 per person per night for over 2 guests. 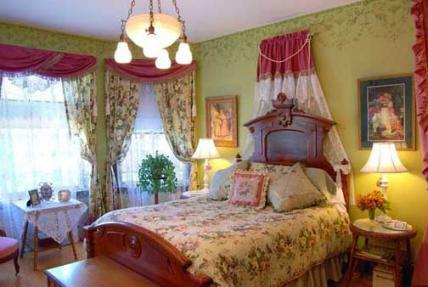 For fans of everything Victorian, the bright and airy Victorian Suite is the room for you! It has a lovely bay window sitting area, Victorian queen sized bed and matching dresser, flat screen TV, A/C, and private bathroom. The Casablanca Suite is beautifully decorated in a tropical Art Deco style of the 1940's. A waterfall dresser with attached mirror, and an antique wicker reading chair are special pieces in this room with a comfortable queen sized bed, flat screen TV, and A/C. A large private bath is attached and the yellow and black tiling is original! Our Hospitality Room is a bright and cheerful space for all guests to enjoy. Grab a treat or an early morning cup of coffee. Have a late night popcorn craving? No problem! The popcorn and microwave are located in the Hospitality Room along with a refrigerator that contains complimentary beverages, a Keurig to brew fresh coffee and tea, as well as a water cooler.